President Donald Trump took his boldest step to level the economic playing field with China, ordering sweeping tariffs on Chinese goods in a move that could escalate already-tense trade relations between the world’s two biggest economies. The president instructed U.S. Trade Representative Robert Lighthizer to levy tariffs on at least $50 billion in Chinese imports. Trump signed an executive memo issuing the instructions on March 22 at the White House. Within 15 days, USTR will come up with a proposed list of products that will face higher tariffs. Policy makers across the world are warning of a brewing trade war that could undermine the broadest global recovery in years. U.S. stocks fell sharply early March 22 amid worries that the U.S. action could provoke a stern response from China, with the S&P 500 down 1.3% at 1:18 p.m. New York time. Meanwhile, business groups representing companies ranging from Walmart Inc. to Amazon.com Inc. are warning U.S. tariffs could raise prices for consumers and sideswipe stock prices. Even central banks, which normally stay above the fray of trade spats, are weighing in. “A number of participants reported about their conversations with business leaders around the country and reported that trade policy has become a concern,” Federal Reserve Chairman Jerome Powell said this week, while cautioning that trade issues haven’t changed the Fed’s outlook. The Bank of England warned March 22 that increased protectionism could have a “significant negative impact” on global growth. Trump tried to make it clear he wasn’t trying to provoke China. The president’s action brought rare praise from Senate Democratic Leader Chuck Schumer, ordinarily a foe of the administration. 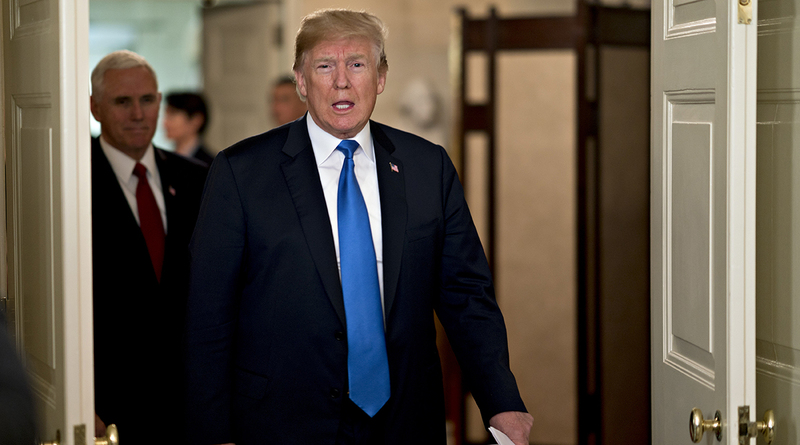 It will be Trump’s first trade action directly aimed at China, which he has blamed for the hollowing out of the American manufacturing sector and the loss of U.S. jobs. The Trump administration is also increasingly signaling it will exclude allies such as the European Union and Brazil from tariffs on steel and aluminum that take effect March 23, suggesting the U.S. is more interested in raising pressure on China, the world’s biggest producer of both commodities. China’s Ministry of Commerce has cautioned against the U.S. taking measures “detrimental to both sides.” The nation strongly opposes such unilateral and protectionist action, and will take “all necessary measures” to firmly defend its interests, the ministry said in a statement on its website. Chinese Premier Li Keqiang said this week that the nation will further open its economy, including the manufacturing sector, and pledged to lower import tariffs and cut taxes. In opening manufacturing further, China won’t force foreign companies to transfer technology to domestic ones and will protect intellectual property, he said.